Attack of the Killer Titmouse! For the last several days, when I go upstairs in mid-morning I often hear a strange sound coming from the bedroom. 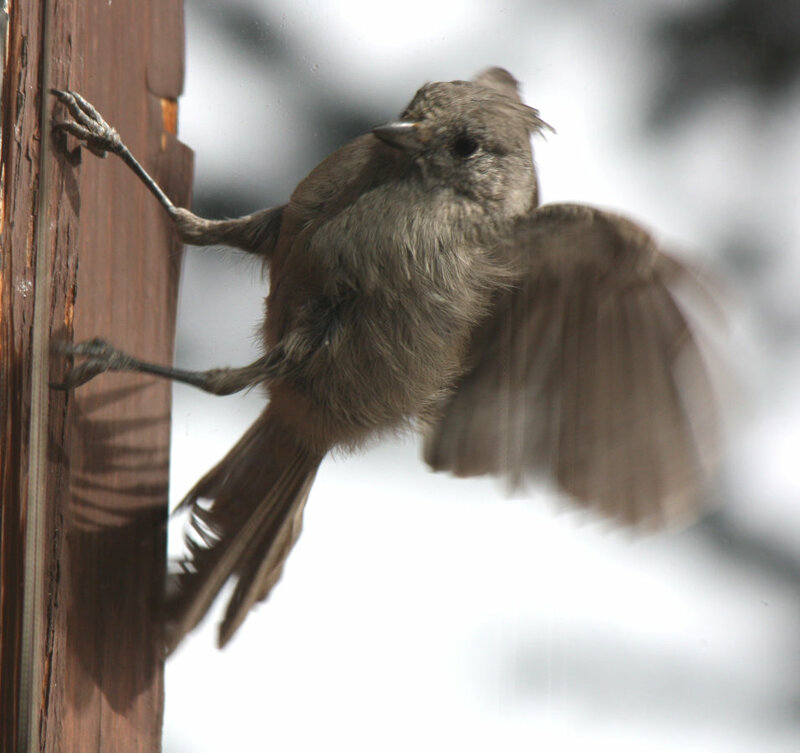 It's a juniper titmouse energetically attacking the east-facing window. He calls, most often in threes, as he flutters around the windowsill, sometimes scratching or pecking the window. He'll attack the bottom for a while, moving from one side to the other, then fly up to the top of the window to attack the top corners, then back to the bottom. For several days I've run down to grab the camera as soon as I saw him, but by the time I get back and get focused, he becomes camera-shy and flies away, and I hear EEE EEE EEE from a nearby tree instead. Later in the day I'll sometimes see him down at the office windows, though never as persistently as upstairs in the morning. I've suspected he's attacking his reflection (and also assumed he's a "he"), partly because I see him at the east-facing bedroom window in the morning and at the south-facing office window in the early afternoon. But I'm not sure about it, and certainly I hear his call from trees scattered around the yard. Something I was never sure of, but am now: titmice definitely can raise and lower their crests. I'd never seen one with its crest lowered, but this one flattens his crest while he's in attack mode. His EEE EEE EEE call isn't very similar to any of the calls listed for juniper titmouse in the Stokes CD set or the Audubon Android app. So when he briefly attacked the window next to my computer yesterday afternoon while I was sitting there, I grabbed a camera and shot a video, hoping to capture the sound. The titmouse didn't exactly cooperate: he chirped a few times, not always in the group of three he uses so persistently in the morning, and the sound in the video came out terribly noisy; but after some processing in audacity I managed to edit out some of the noise. And then this morning as I was brushing my teeth, I heard him again and he was more obliging, giving me a long video of him attacking and yelling at the bedroom window. Here's the Juniper titmouse call as he attacks my window this morning, and yesterday's Juniper titmouse call at the office window yesterday. Today's video is on youtube: Titmouse attacking the window but that's without the sound edits, so it's tough to hear him. 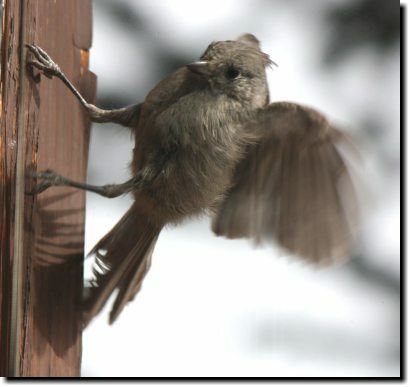 I feel a bit sorry for the little titmouse, attacking windows so frenetically. Titmice are cute, excellent birds to have around, and I hope he's saving some energy for attracting a mate who will build a nest here this spring. Meanwhile, he's certainly providing entertainment for me.